This handsome new knife has never been used or re-sharpened, and comes with a Limited Lifetime Manufacturer's Warranty. It is 4 1/8 inches long(folded/closed) and weighs approximately 3.4 ounces. The blades are C75 Carbon Steel etched with "Tree Brand Classic". 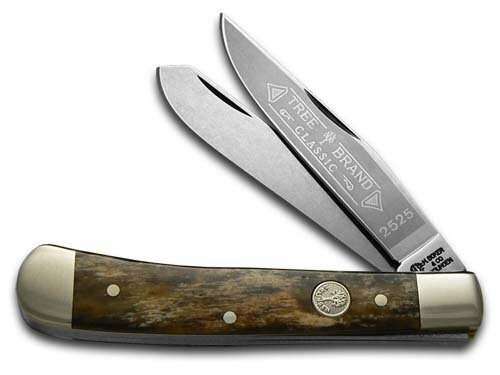 The handle is Buckskin Bone with a Round Nickel Silver Boker Inlay shield. The bolsters are highly polished Nickel Silver. So, if you're looking for a great knife to collect, carry, or give as a gift... don't pass this one up!